1. High carbon steel blade. 2. Handle: heavy iron handle. 3. 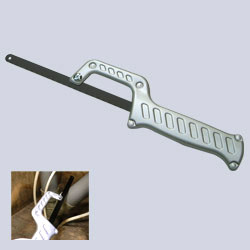 Use: saw iron tube and PVC tube, especially for using in tight, available with H.S.S. Bi-metal blade. 1. Blade: 12" (300mm). 2. Hard to reach places; adjustable device, uses blades from 4" or longer. 3. Packing: half sliding card, 12/96ctn, 15/16kg, 1.9’.